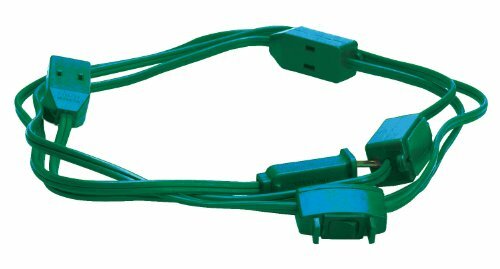 Woods 2189 9-Outlet Indoor Extension Cord, Green, 15-Foot. Vinyl jacket resists abrasion, moisture and chemicals. Power On/Off switch and fused male plug. Rated for 5A/125-Volts, Industry approvals: UL Listed. 18/2-gauge cord provides enough outlets to light an entire tree. For indoor use with decorative light strings, lighting holiday villages and miniature buildings. Outlets feature small eye hook to secure and hold in place. Industry Approval is UL listed. Industry Approval is UL listed. The Woods (R) brand is a registered trademark of Coleman Cable Inc. If you have immediate questions about application, installation, troubleshooting, or a damaged component, please call CCI Consumer product hotline at 1-800-561-4321 or email questions to: CCI.ConsumerSupport@southwire.com.